The LaPorte Slicers boys basketball season has started off right under second-year head coach Kyle Benge. The Slicers currently have a record of 11-8, which is much improved from their 5-13 start of last season. They picked up big victories against powerhouse teams such as the Chesterton Trojans and the Logansport Berries. Their impressive run has included a six game winning streak, which was recently snapped in a close loss to the Plymouth Pilgrims. That game ended with a final score of 69-68. 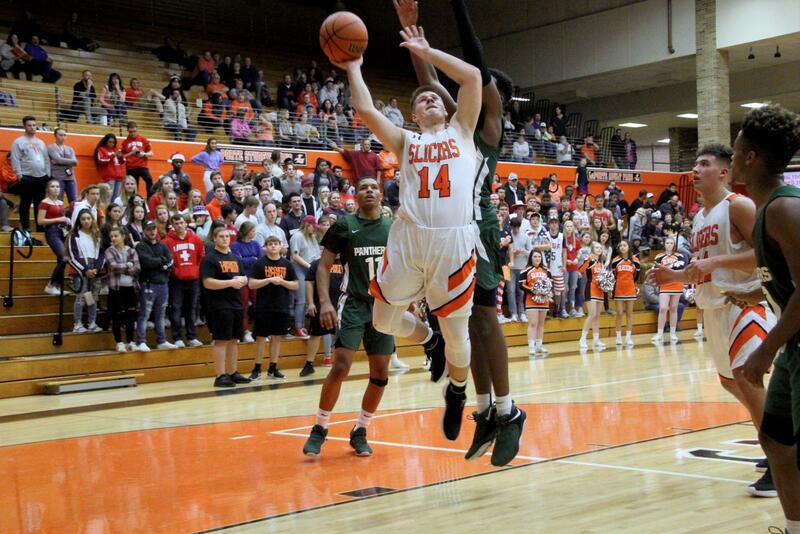 The Slicers also started off the year 3-0 in the DAC for the first time since the 1996-97 season. One key factor to the team’s success is their superb work ethic and teamwork. No team will succeed without good communication, and they have proven it. “Playing with the team and doing what I have to do to win,” said freshman forward Grant Ott-Large. Another factor to the team’s success is second-year head coach Kyle Benge, who previously coached at Kentucky Wesleyan University. He played high school basketball at Plymouth and played college basketball at Huntington College. It’s safe to say that Benge’s basketball knowledge and background made him a qualified candidate to become LaPorte’s new head coach. Although LaPorte has started off well, they need to keep up their pace at practice and in games in order to win. There are only two games left, and LaPorte will be playing in their first Sectional game on February 26th, so the team will need to keep up their good play if they want to compete in Regionals. As well as sticking to their teams strengths, the team could also improve some of their weaknesses that may be dragging them down. “I could work on my jump shot and also my turnovers because I make a lot of mental mistakes on transition so I’ve been trying to work on that,” said senior forward Drake Gunn. LaPorte plays their next game against conference rival Michigan City Wolves on Friday, February 15th at 7:00 p.m. at LaPorte High School. Come out and support the Slicers who are looking for their fourth conference win of the season.